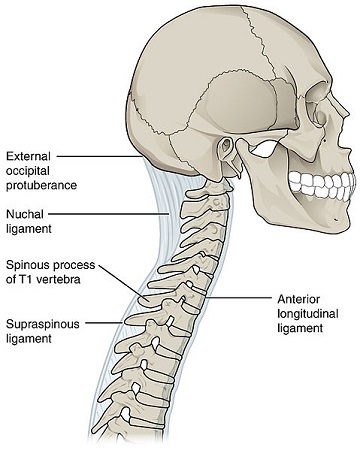 The supraspinous ligament or supraspinal ligament is a strong fibrous cord that connects together the apices of the spinous processes from the seventh cervical vertebra to 3rd or 4th lumbar vertebrae. From vertebra C7 to the skull ligament becomes structurally distinct from more caudal parts of the ligament and is called the ligamentum nuchae. Origin: It originates from C7 vetebra. The supraspinous ligament is well developed only in the upper lumbar region and may terminate at L3, although the most common termination site appears to be at L4. The ligament is almost always absent at L5/S1. It is thicker and broader in the lumbar than in the thoracic region, it merges to thoracolumbar fascia. 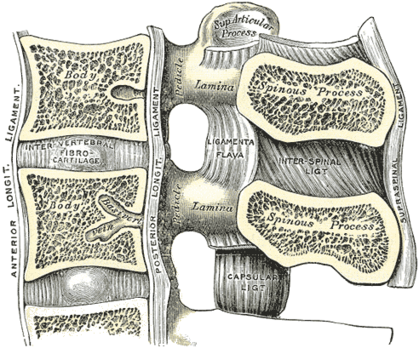 The most superficial fibers of this ligament extend over three or four vertebræ; those more deeply seated pass between two or three vertebræ while the deepest connect the spinous processes of neighboring vertebrae. \The deep layer of the supraspinous ligament is reinforced by tendinous fibers of the multifidus muscle. Between the spinous processes it is continuous with the interspinal ligaments.The middle fibers of the supraspinous ligament blend with the dorsal layer of the thoracolumbar fascia. Limits flexion along with other ligaments of vetebral column. The supraspinous ligament serves as a midline attachment for some important muscles. The supraspinous ligament helps maintain the upright position of the head. It's stretched in flexion, it`s fibers resist separation of spinous processes during forward flexion, during hyperflexion interspinous ligament and supraspinous ligament are the first to fail.